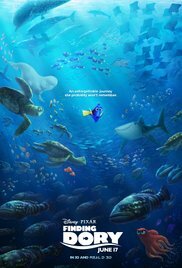 Tonight we went to see Finding Dory. A sequel to Finding Nemo, that filled in Dory's backstory. And the CGI is spectacular these days. But it was pretty silly. Didn't quite have the same heart and soul of the first one. So they cross the ocean. In about about two minutes of screen time. The rest of the story is at the other end. Which is fine, it was just a bit jarring. Stay to the end of the credits. And then wonder how they managed to survive like that for that long.